I am just a big kid, Sue wanted me to get a trampoline for the summer, keep Jarreth from going on about Xbox (cos he ain’t playing except for weekends). I grudgingly agreed but deep in side a little voice was doing a Homer and shouting “Tramampoline! tramampoline!”. It’s really great we have had loads of fun on it already. It’s has 10ft diameter and that’s quite big, certainly big for my garden and it came with a safety net and weather cover all for the lovely price of £150. I managed to assemble it myself in about 1.5 hours, it was easy, and within another half an hour I managed to hurt myself. Today I ache. My legs my arms my back is killing, one thing you don’t get with it is ibuprofen. Even Sue had a go and kind of enjoyed it, which is a big deal considering she came close to losing her tongue when she nearly bit it off in a trampolining accident in school. 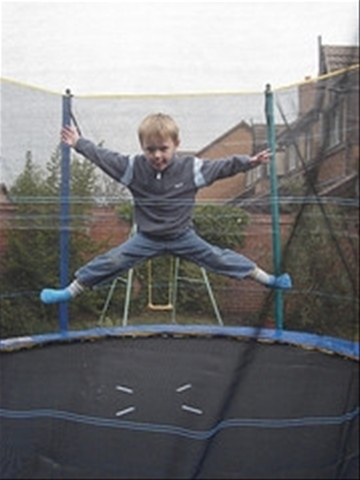 Much of our tutelage to Jarreth in the art of trampolining involved telling him to shut his mouth when he’s bouncing. Still I cannot recommend it enough we got it from “Tim Bear Garden“, now we were able to visit the shop as they are based locally to us and we could see a complete range of things so we did not purchase from the web but direct. I wish we had a huge garden as there were some great climbing frames Jarreth was all over one of them as it had proper climbing holds as I’ve told him when he’s older we’re going climbing so he wanted to practice. For the serious bouncer they also have some really good trampolines made by TP, much better quality than the duraplay we got, but with a larger price tag to match the quality. It’s midnight and dark outside but I want another go, perhaps I can sneak out before work tomorrow.